I have a new love and it’s name is Stitch Fix. Stitch Fix is the answer for the girl who is in desperate need of a wardrobe update, but has literally ZERO time to shop. It’s also the answer for the girl who wants to go out of her clothing comfort zone, but doesn’t know where to start. I discovered Stitch Fix on accident or maybe they just want me to think I did. I was taking a calming Youtube break watching a lovely video made by british blogger Zoella when I noticed a little blue ad in the corner of my computer screen. It intrigued me so I clicked and I’m so glad I did. Stitch Fix has all the benefits of a personal stylist with a only a fraction of the price tag that comes along with it. Stitch Fix is like that friend that grabs things off the rack for you to try on, the one who goads you into a dress that you’re not sure is you, but once you try on, you realize you’ve found a perfect fit. When you sign up for Stitch Fix, you fill out this long personal profile that really delves into where you are at now with your wardrobe and where you want to be. Fill out the profile with as much detail as you can muster! It lets your stylist get to know you so she can pick out pieces that you will absolutely love. Once you sign up and fill out your profile, it’s time to schedule your fix! I have my Stitch Fix coming monthly because I’m in need of a lot of new pieces and with a busy work schedule, I have no time for a proper shopping trip. You are charged a flat styling fee of $20 once your stylist gets to work on picking out your fix items. The awesome part about that is that if you buy ANY piece from your fix, the styling fee is applied to your purchase! I definitely took that into consideration when I bought my items! Now, finally, let’s get to my fix! 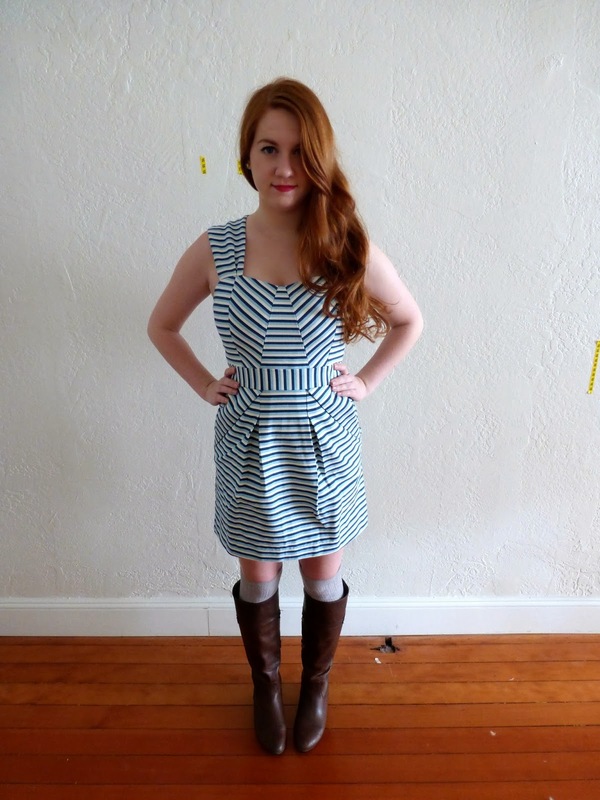 The first piece in my fix was a really cute navy blue/white striped sheath dress. In this photo, I paired the dress with a 3/4 sleeve long cardigan and pair of black flats. I thought this dress was very cute and a great addition to any work wardrobe, but since I already have so many sheath dresses, I took a pass on this one. I was a little sad to do so since I dearly love stripes, but I know there will be more dresses, stripes and fixes in my future. I was able to pair together three pieces in one shot thanks to my awesome stylist Dana. The Fenton Distressed Boyfriend Jeans were really cute and I really wanted a pair of laid back jeans for weekend wear, but I really didn’t like the distressed part. I don’t like spending money on things that have holes in them, even if it is on purpose. I had to take a pass. The cardigan was a light and super comfy fabric with a pretty airy knit design all over it. I really did like this cardigan, but for $78, I needed to love it to purchase. The last piece in my outfit was the the Tallia Embroidery Detail Tank. I actually thought that this would be the once piece in my fix that I would not like. I was quite wrong. It fit me beautifully and was perfectly flowy. The embroidered pattern was beautiful it worked great with a pair of jeans. This end up being one of the pieces that I could not pass up! As soon as I pulled this dress out of the box, I knew I had to have it. The fit was amazing, showing off my assets and hiding any flaws. I also loved the print. The two different blue tone lines looked lovely with my hair and skin-tone. The bonus of this dress was that it also had POCKETS! I love dresses with pockets. I knew that this dress, albeit pricy, was a keeper! I wore it to work the very next day, pairing it with a long blazer and dark brown ankle boots. It put such a spring in my workday step. Stitch Fix is an absolute must for me and those looking for a wardrobe refresh that don’t have the time to shop. I got to try on each and every piece in the comfort of my home and had three days to choose what to keep and what to send back in the big pre-paid envelope that they sent. As a bonus, if I ever find that I love EVERY piece in my fix, I get a 25% discount on the entire purchase! I’m so excited to see my next fix! I asked for fun pieces to ring in Spring and I know whatever my stylist, Dana, picks out will be awesome! Here’s my referral link in case anyone reads this and feels like this is something that they just NEED to try out!